AvoColor – A natural food color additive from the seed of the avocado. Natural food color. Simple and pure. AvoColor® has no impact on aroma and taste. AvoColor® is a patent-pending technology for vibrant oranges and reds. AvoColor® is stable over a wide range of temperatures, pH, and water activities. AvoColor® meets the needs of a rapidly-changing color additive market. AvoColor® is stable to light and oxygen exposure. AvoColor® is clear and vibrant – making it ideal for beverage applications. AvoColor® is a natural food color additive that covers 40% of the color spectrum. 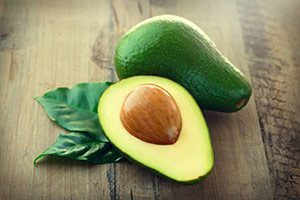 AvoColor® is a natural food color additive from the heart of the avocado – the seed. Developed by Persea Naturals, LLC, AvoColor® is a yellow-red food color additive that addresses the growing need of food manufacturers for natural food colors. Produced from the seed of the avocado, Persea Naturals doesn’t use marketable fruits and vegetables to manufacture AvoColor®.